Just like that, Earl has moved on. As the music world (from NPR to Pitchfork) commemorates the endless accomplishments of this rare genius, it’s clear that we’ve lost a ‘once in a lifetime’ musical figure, and there is so much to be in awe of. But as I sit here blasting ‘Get In Line Brother’ on my home stereo, I’m just in awe of what it feels like to be a banjo player at this moment in time. It’s so heavy–sadness, celebration, gratitude, inspiration, amazement, etc. I literally have no idea what I would be doing with my life right now if it wasn’t for Earl Scruggs. It’s a powerful and humbling realization. So today I’m immersed in the beauty of his art and his influence, reveling in the joys of music and community, experiencing a newfound appreciation for what Earl’s done for me and for us all. I have always loved bluegrass and the banjo, but it’s just never looked quite like it does now. Earl was a living legend, long revered as the most innovative, influential and genius 5-string banjo player there will ever be. Very few people, if any, have done what he did: to invent/innovate the technical style that defines an instrument (a complex one at that!) and then go on to fully realize the creative expression and beauty that this new style is capable of. It’s a process that usually takes generations of players, the accumulation of influences, a collection of minds and years of collective development. But somehow Earl tapped into the highest order of inspiration, creating a standard that defines not only an instrument but also an entire thriving genre of music. His style is the bedrock of everything that three-finger style banjo players will ever accomplish. I cannot think of another musician in any genre who’s influence is so universal on their chosen instrument. Initially inspired by more contemporary players, I came to Scruggs later than most banjo players. Ultimately it was Ben Eldridge who told me that I had to REALLY understand Scruggs’ playing if I wanted to be a complete musician on the banjo. I don’t remember his exact words but the message was clear: whether you want to be a straight-ahead traditional player or the most progressive banjo player out there, it all comes from Earl. Of course I had ‘learned’ a good bit of Scruggs’ music, but I never really understood it. In the creative realms, appreciation always precedes understanding. So it was then that I really started listening, and in turn appreciating. I remember going to Jon Weisberger’s home in Madison, TN, eating dinner and then listening in amazement to vintage Earl cuts from various points in his career. I can recall the deep curiosity upon hearing the banjo solo on ‘Why Don’t You Tell Me So’ from the ‘Mercury Sessions,’ my preconceptions of Earl’s style disappearing in real time. I remember buying ‘Tis Sweet To Be Remembered,’ and listening to ‘Foggy Mountain Special’ a million times on repeat with a giant question mark over my head. I was intrigued and baffled, but also totally entranced with the musical ideas and their effortless, perfect delivery. Then I started to get it, even just a tiny bit of it and I remember playing ‘Fireball Mail’ for the first time, even though I had played it a hundred times before. It was totally magical, all of it and a lifetime of learning was underway. 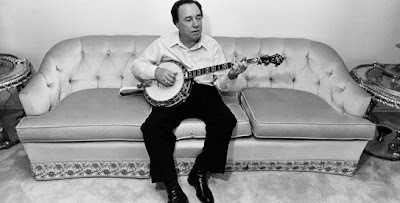 I am by no means an expert on Earl’s style the way some are, but elements of his playing, mostly his timing and authoritative delivery, are now the most important elements of the banjo to me. And when it’s time to play something straight ahead, his amazing lexicon of musical ideas cannot be topped and never will. It’s rich with nuance, a lifetime’s worth of hard work. The mechanics of the instrument are elusive, but somehow that perfect blueprint just showed up in his mind. Even for players with a much more modern sensibility, understanding Scruggs’ style is what puts all the ideas into context. It’s the roll, the melody, the timing, the tone. It’s perfect and it’s all Earl. We as banjo players will always continue to innovate and evolve and Earl wouldn’t have it any other way. But the mystery of how to make beautiful music with three picks and five strings has already largely been solved. He gave us the tools, and now we celebrate him with our music. It’s unreal. It’s beautiful. 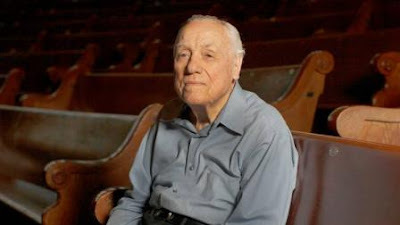 Thank you Earl Scruggs. We are forever grateful.